Happy Thursday, BWRC! Over the next few months, on top of our weekly member spotlights we will also feature a weekly post on our board members for everyone to get to know what it is each board member does for the club as well as to get to know them individually! Kicking things off this week is our Club President, Jim Kowalski. We asked Jim to share more about his role as president, his vision for the future of the club, to share a little bit about his own personal running journey, and finally to share some interesting facts! We hope you enjoy this post and future ones to come! Q: What is your role on the board and what are your responsibilities? Jim: I share the role of Club President with my lovely wife Amanda. Her official title is Co-Chair for legal purposes but she’s the boss. I wear many different hats but my primary role is to collaborate with our Directors, Board, and Members to make sure the BWRC member experience is positive and impactful. I represent the Club in the community and work with our sponsors to schedule group runs. Making sure we are following all the various state and federal legal requirements as an incorporated non for profit is a boring but necessary part of my role. Q: How long have you been a runner? Why did you start and why do you continue? Jim: January 2012 is when I started. I started immediately after quitting a 2 pack per day cigarette habit. Amanda had been running for a couple of years. I saw how happy it made her so thought I would give it a try. Within a month I had a new addiction, this time to running. Q: Do you have any upcoming races or goals that you’d like to share with the club? Jim: We’re running the Chicago Half Marathon on September 23rd as a tune up for the November Monumental Marathon in Indy. I’d like to stay healthy and PR at both (Half 1:47, Full 3:51). Q: Tell us a little about yourself outside of running. Jim: I’m in telecom sales (snore) and still unsure of what I want to do when I grow up. I am the proud father of my son Ryan age 28 and daughter Taylor, 22. At their ages, we treasure what little time we get with them. Amanda and I love to dine out, sometimes too frequently. Interesting fact… In 2011 I tore through the field at the Area Rock Paper Scissors challenge and advanced to the regional round for a chance to compete in Vegas. At Regionals I won my first 4 matches only to lose in the semifinal in a hard fought yet heartbreaking tie-breaking set. I was one round from Vegas but my rock wasn’t enough to defeat paper on that final draw of hands. Q: What is your favorite race mantra? Jim: I have 2 favorites. 1.) If you think you can, you can! If you think you can’t, you won’t. 2.) Run the mile you’re in. Q: What is your vision for the future of BWRC? Jim: The Club has grown so rapidly in a very short period. The path we are on is the right one and already impactful. That path is leading to more opportunities to get involved in our local communities. I envision BWRC to be known in those communities as a reputable organization which promotes running as a contributor to a healthy lifestyle while providing an inclusive platform for individuals at all levels to participate. We’re going to have a ton of fun along the way. Q: What does being a member of the BWRC board mean to you? Jim: To be a part of this group of people who are committed to making BWRC the best organization possible is so rewarding. We listen to the wants and needs of our membership then work closely together to make things happen. I’m honored and privileged to serve our amazing BWRC family!!! James: About 6-7 years now. In middle school and early high school I dabbled with running/triathlon for very brief periods although I was never a good endurance athlete. After that, I did a lot of running on my high school lacrosse team. I basically took a good +20 year break from any type running due to bouts of drinking, gluttony, smoking, with endurance exercise being for other “strange people.” Now I’m one of those strange people. My inspirations were from my Uncle who did marathons and triathlons in the mid/late-80’s when it was still cotton and iPod free. At that time I also once every year found myself captivated by the TV coverage of the Hawaii Ironman race. I found all the athletes (fast and less fast), their stories, and the challenge itself totally awe-inspiring. Much later I found inspiration from ole buddies who had received the running bug (to various degrees, even if briefly) who showed that our old habits could be dropped and better ones adopted. My motivations were that by early 2012 I’d been smoke-free 3 years and I felt it time to try out some refurbished lungs. However, I also grew to 220lbs and had developed 250 cholesterol at 34 years young and my doctor hot on my case. Yikes. My illusion as a slightly overweight ex-athlete on extended exercise-free holiday finally was officially done when put in the “obese category”. I reevaluated that maybe the slow 15-year slide down physical mediocrity wasn’t as fated and natural as I once thought. As a result of those motivators in early ’12 I did one of the many walk/run programs from the internet and after some initial hiccups, 3 months later and 30lbs lighter, I ran 4miles straight for the first time one late autumn night. I was pretty blown-away at that and I remember it as well as any of race I’ve ever done. It was that night I first ran 4miles I think I was “hooked” and I didn’t want to lose that capability again anytime soon. Q: How did you find BWRC and why did you join? James: I think it was through a Strava search or Instagram. It was by far the most worthwhile social media ball to bounce my way. It was this February and I was looking for some good peeps to run with during my marathon training and where I didn’t have to travel so far. I went to Nickol Knoll on a cold Tuesday night and immediately there was a nice size group which was welcoming. I knew I’d be back. Q: Why do you run? James: To see what my ceiling is when I consistently put in the time and miles. Also to eat and drink without the fuss originally (and still). Now it’s as much if not more the camaraderie and the friendships. It has also added consistency and dependability to my life. I am left feeling healthy, productive, and fortunate after workouts. For me, running gets more fulfilling the longer you do it. Q: Do you have any upcoming races or goals we should know about? James: Biking and running as much as I can before it gets cold again! Nothing concrete for the fall though I’m mulling a number of options. Maybe I’ll focus on some shorter races (5k/13.1) which I’ve never really done. Whatever run or bike races I do I would like to hopefully go a bit farther or faster doing them. More important than that is I want to enjoy the process in the attempt and hang out with awesome people along the way, which I happily am. Q: What does BWRC mean to you? James: Support. Solidarity. Dedication. Friendship. It’s fun to see mates also achieve their goals given the hard work they put in to get there. The crew is awesome, dedicated, no-fuss, and very supportive. These are amazing attributes given how large the group is; great runners and better people. This week’s Member Spotlight Monday is Carol Heunisch. 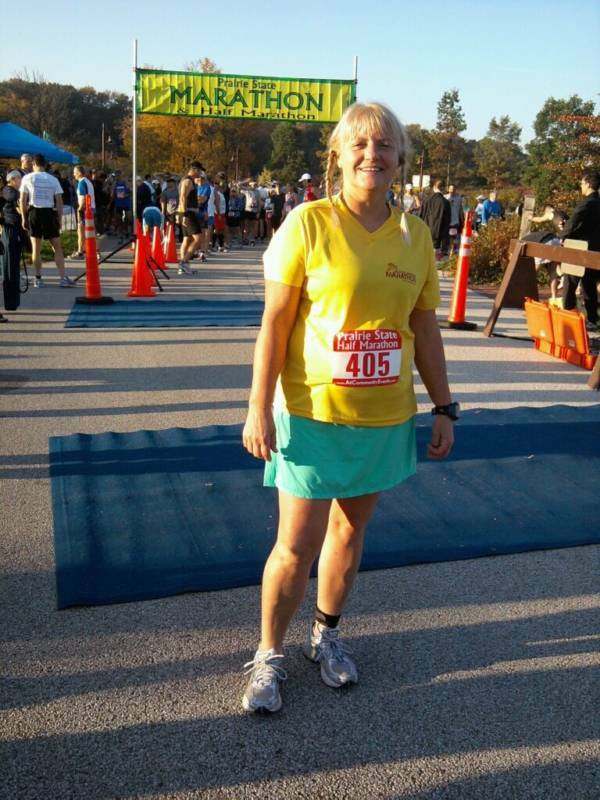 Carol started running in 2005 and hasn’t looked back since, running countless 5Ks, 10Ks, and half marathons. She will be running 3 marathon majors this fall and will officially have completed all 6 in 2019! Thank you, Carol, for sharing your running story and for being an inspiration! Carol: I have been running since about 2005. Geez, why didn’t I start sooner? Carol: I started running basically for stress reduction. At the time I started running, my daughters were still in grade school, and my parents started having health issues that required me to help them out as well. And oh yes, I work full-time as well as a pharmacy manager in a hospital, so I’m pretty much always on call. One day I just decided to go out and run at Melas Park. I still shudder when I think of what I wore—cotton! Who does that? But I fell in love with running, ran outside all summer and fall, bought a dreadmill, and pretty much ran 5-7 miles every day. After about 6 years, I figured I should run a race—and it probably took me another year to get up enough nerve to run a 5K. 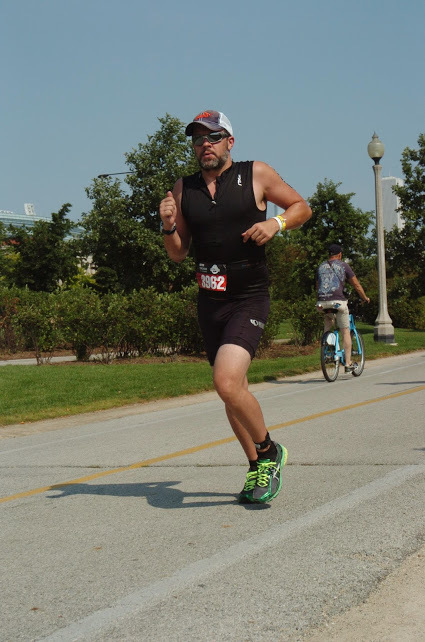 In 2013, I signed up to run Chicago, and also ran an obscene number of half-marathons, 5 and 10ks. I got derailed shortly after that with my parents issues, but got back into running last year. 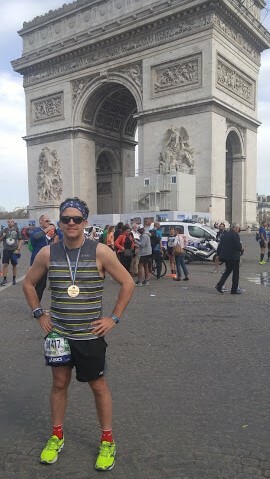 I ran Chicago in 2017, and also ran Boston and London this year. And please note, I ran Boston for charity—I’m way tooooo slooooow to time qualify! I’ll leave that to you youngsters. Carol: I found BWRC because after the CARA marathon training season ended last year, Jimmy sent out an email saying that he and Amanda were forming the club, so I thought I should join to keep myself motivated in the off season. I have always kicked myself when I hibernate over the winter and have to start training from scratch in the spring. I still don’t like running in the cold but I enjoyed running this winter with the group. Carol: I run because I hope it’s going to keep me healthy and living for awhile longer. I’m happy to say that I don’t have many of the geriatric health issues that many people do, and I attribute that to running. It also helps to keep my weight in check and I generally feel better about myself and the world after a run. You know how you get anxious and crabby if you miss a run? Yep, that’s me. Plus runners are just awesome people, and our club has a bunch of the best. I usually don’t talk much when I run but I love to eavesdrop on everyone’s conversations. Carol: It’s embarrassing but I’m running Berlin, Chicago and New York this year. Dumb luck, I got lottery entries for both Berlin and New York! I always run Chicago for the American Heart Association because my father had heart failure, and I myself had atrial fibrillation. And then I’m running Tokyo in 2019—completing my 6 star! Carol: What a great group of people! I’ve really gotten to the point of disliking running alone and always try to join a group run—and it seems like someone is running somewhere in the area every day. Fred: I “kind of” started running between my Junior and Senior year of high school. It was all very covert; I would wait until it got dark so no one would see me. I would run/walk up and down Addison Street from my house to Wrigley Field (about 2 miles). I did that all in one summer then I stopped running. I only started back up a few years ago. So there were many, many, many years in between. Fred: After high school, I started smoking and didn’t exercise too much. Every now and then I would go to the health club with my friend and afterwards we would light up a cigarette as we were walking out. It was like this for at least 10 years. After my wife became pregnant I knew I had to quit smoking. After struggling with quitting, my love for junk food took over and I really started gaining the weight back that I lost in high school. I used to donate blood every now and then, and they initially run a quick test to see if you are ok to give blood. Well, one time the phlebotomist told me that my cholesterol and BP were too high to give blood and that I should schedule an appointment to see my doctor. After finding out from my doctor how bad my numbers were, I knew something had to change. Starting running again was so tough; it seemed like I could barely go a block before I had to stop. Luckily for me I persisted, and even though my numbers aren’t great…they have gone down considerably since I started running more. Fred: I found BWRC after the CARA training for the Chicago Marathon last year. I always ran alone because I felt I was too slow to run with other people. When I was training with CARA, I found out how much I liked running with others and that there are runners of all paces. I definitely wanted to keep running after the marathon and it seems like a lot of runners who trained with CARA are with BWRC now, so it all worked out great! Fred: There are so many reasons, but mostly I keep running for the health benefits. I want to be healthy enough to do things with my family, and be there to watch my kids grow into adults. Running is definitely a good way for me to relieve stress as well, sometimes I will just put my headphones on and anything that was bothering me goes away. I can be tired, sweaty and have sore legs, but still feel great mentally after a run. Fred: I’m currently training for the Chicago Marathon. I haven’t committed yet – but I want to do the Amita 1/2 and the Alpine 1/2 in September. Fred: BWRC is the main reason I was able to keep running after the marathon. I have met so many amazing people in this group and everyone is so supportive and knowledgeable. It truly is like one big family. I’ve gotten so much advice on running and non-running things. I’m not that big of a talker…but I do like to listen, especially on runs – I guess it takes my mind off of the running. BWRC really makes me look forward to running. This week’s BWRC Member Spotlight is Mary Radloff Klabacha. Mary is running her first marathon this Fall at the Chicago Marathon and is fundraising for Team Fox to which she has a very personal connection. Thank you, Mary, for sharing your running story with us; we love having you as part of the BWRC family! Mary: My 1st 5K was Chase to The Taste in 2006 when I was a volunteer for The Des Plaines Special Events Commission. I registered as a walker and as soon as I saw everyone start running, I changed my mind and ran, not wanting to be the last person to finish. That got me excited about running and I did many 5Ks over the years. I only ran during the “running season” and would have to start all over again each Spring. In 2015 I decided to show up to Coach Nick Nowicki’s Speedwork at Melas Park, just to see what it entailed. I had the good fortune of meeting running legend Judit Miko, and I have tagged along with her ever since! I finally aimed higher completing a couple 10Ks in 2016, my 1st 1/2 Marathon in 2017, and am currently training for my 1st full Marathon. I started running in my 40’s and it’s been “baby steps” progression but that’s OK! Mary: I started because it’s a great way to stay healthy and positively reduce stress. Years ago my cholesterol level was borderline high- I was able to greatly improve the “good cholesterol” by diet/exercise so my ratio has remained healthy and I didn’t need to take medication. I am sure running benefits us in so many positive ways! Mary: Some of my running friends from other groups had heard about BWRC and we all decided to check it out. Every one of us has loved the warm welcome, support, fun, and friendships we have developed thanks to this awesome group! Mary: I like to eat a lot and drink wine! Ha! I am more or less hooked on running. Even though I currently have some IT Band issues, I have learned we are much stronger than we give ourselves credit for. I am treating the IT Band while Marathon Training- Runners are a very committed, supportive, and motivated group! That’s one of the things I most love about the running community. Mary: I am training for my 1st full Marathon- Chicago 2018, while fundraising for Team Fox (on behalf of The Michael J. Fox Foundation for Parkinson’s Research). My big sister Susie Stephens lost her 20 year battle with this progressive neurological disease in March 2017. She was an amazing lady and is greatly missed (I’ve included a photo of Susie as a young MD). Thanks to CARA/BWRC Training I am really excited to complete 26.2 miles while also helping the millions of people impacted by Parkinson’s. Mary: BWRC is like a family of friends, all sharing our love of running and pursuing our goals. We can count on each other for support and good times. I am also happy that BWRC is doing great things to benefit our community, as a nonprofit. Looking forward to our runs and fun times ahead!! Thanks BWRC! Mary Jo: I have been running since 2011. I ran my first marathon in 2014. I never considered myself a runner because I didn’t run as fast as a lot of other runners. I have learned if you run, you are a runner no matter what your pace is. Mary Jo: After training for two marathons on my own, I had thought about running a third, but I needed to do something different with my training. I did most of it at the forest preserve near my house. The loop was 3 miles and many times it was hard to get those Saturday long runs in running a loop 6-8 times. Even the deer started looking at me like I was crazy. I had contemplated joining CARA, but I was nervous about training with complete strangers whom I was sure were a lot faster than I was. I wanted to get myself out of my comfort zone and signed up to train with them. How awesome was it going to be to run with people with the same interests. Not everyone understands why people choose to run. My training was an incredible experience. I ran with the greatest pace group, my group leaders were awesome. When training was coming to an end, I thought, “what was I going to do when CARA was over?” Would I just wait until the Spring to start running again and lose all the momentum I gained throughout the summer? That’s when I heard that BWRC was being put together and it was a no brainer that I would be joining this group. I just wish that I had the same endurance as Amanda and Jim to run in those frigid temperatures. They are my heroes! Mary Jo: I run for two reasons. One is for health reasons; I have genetically high cholesterol and I refuse to take medication for it. Since I have been running I have gotten my levels under control without medication. My bad cholesterol level is now in the normal range. My cardiovascular results from my last physical were the same as someone that is in high school. Running is good for my health! The second reason is I love how I feel when I run. There is nothing like those endorphins. I have found that anything is possible. There are days when I have a bad run and want to give up, but then that next one is amazing. It’s surprising to me how I can struggle during a race and think I’m never doing this again and when it’s over, I’m already looking for the next race to sign up for. 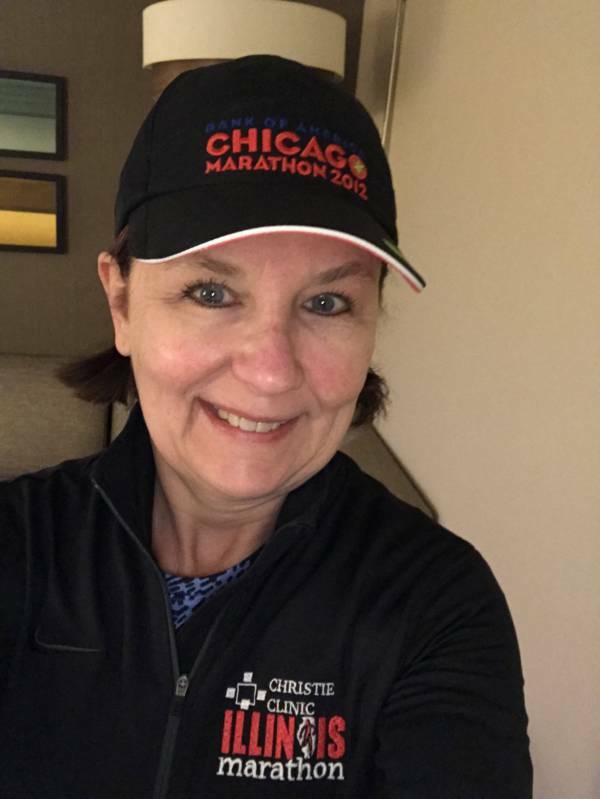 Mary Jo: After trying to convince all of my friends and myself that I was done with marathons, or at least for 2018, I signed up for the Monumental Marathon in November in Indianapolis. After running all three marathons in Chicago, I thought it was time to try something new. I’m really excited for it! Sometimes I think that I’m crazy to be excited to run 26.2 miles. I am also looking forward to our upcoming half marathon road trip in Nashville in April 2019. Mary Jo: BWRC means friendships, accountability, and runners supporting runners. I love that when I finish a race and things didn’t go the way I was hoping, the group is there with hugs, smiles, high fives and that pat on the back that I need. The group is so motivating and truly cares for each and every runner. 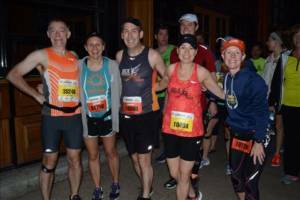 We had an amazing time at the Carmel and Wisconsin half marathons in the Spring. The best thing that I ever did was join a running group. I don’t see myself retiring from running for a long time. If I tell you that I won’t be running a marathon in 2019, don’t believe me. Praveen: I have been running for the past 2 and half years. Yeah, not a long time ago and I can’t believe that I am still running. I was new to long distance running with no stamina nor mental strength. The longest I had run was 800 meters and that was when I was 10 years old. So it was no brainer; the key was to take baby steps. The first year it was all run-walk, initially it was more walk minutes and less run and gradually improved with more run minutes and less walk. This helped me build the stamina and prepared the mind for long distance running. 2 years of forcing my legs to work hard, giving lot of pain and running lot of miles, now I can say “I am a runner”. Praveen: I am a great lover of food who like tasting different cuisine and if the food is good will hog it. No control at all. I was a couch potato; binge watching, eating junk, no exercise routine and the list goes on and on. February 2016 is when it all started. My wife and kid were going on vacation to India and my wife asked me to weigh her luggage before going to the airport. I stepped on the weighing machine and could not believe my eyes. It was showing 197 pounds. I checked if something other than me was on the machine. Nope nothing…I weighed again; no changes. That made me think, “how will I lose these extra pounds?” No idea..like a typical couch potato I did not do anything about it and left it there. After a week or so at work one of my colleague asked me if I wanted to run a half marathon and join group of people (colleagues) who were planning to train for it at Busse Woods. I laughed at him. “Me and running, no way; not my cup of tea.” But they kept on pushing me. “Why not? Just give it a try. Train for some days, if you can, then do it, otherwise quit.” That was the push this 197 pounder needed. So I registered for my first half marathon (Chicagoland Spring 1/2 marathon at Busse). Yup it was a couch to 13 mile (LOL). The race was just three months away and the training started. The first few days of the training were just walking on the treadmill to get the feel of it and the long runs we planned to run at Busse. I still remember my first long run. The temperature was around 35 degrees and the plan was to run 4 miles. We started jogging and after 0.2 miles I stopped. I could not run any more. I was huffing and puffing, my heart was pounding harder, and I was ready to quit. As they say the group always helps when you are down. A couple of my friends said they would walk with me and we started walking for 2 miles into Busse and back and my journey to lose those dreaded extra pounds started. This journey which started for weight loss became a passion and I started loving it. Now it has become part of my life. After eight months of run/walk, three half marathons, one 10K, and a healthy eating habit (thanks to my wife), I lost 35 pounds. Phew that was hard; but as runners say, you got to do what you go to do. Praveen: Nov 2016 – One of my colleagues at work put this crazy idea of running Chicago Marathon into my head. At that point I was just an amateur run/walker who got into running 8 months ago and both physically and mentally I was not at all ready for a full marathon. Like my first half marathon, my running friends started pushing me to register for the Chicago full. That small push definitely helped me to register with a hope that I would not get selected in the lottery. To my surprise, after a month I got an email which said, “Congratulations! You have received an entry into the 2017 Bank of America Chicago Marathon.” I was ecstatic and at the same time clueless. Ecstatic with the thought of running a full marathon, clueless on how to climb the huge MOUNTAIN in front of me! Even though I ran with group of friends I ended up running alone as each of them were running at their own pace. The majority of the time I ended up not completing my long runs as I was getting bored. So I needed some formal group training and I joined CARA and started running with the 10:30 group. A few months into my training, I started admiring the runners, their commitment and discipline. Experienced runners with their valuable suggestions and guidance made me dumbfounded. To name a few Jim, Amanda, Emily (our site coordinators), Coach John (Nutrition expert), Peggy (my group leader), and many more. Every long run at Busse made me love running even more. Around August 2017 I saw a “Home Sweet Home” post on Facebook from John Wall with just a map. At that point of time, I had no clue what that map (Busse 7.3 mile loop) was and what was happening. The following weekend after our long run, Jim told me that they were planning to continue running in Busse once CARA summer training was over and I could join the group if I was interested in continuing running with them. It was a no brainer for me; I joined BWRC. Our first race as the BWRC group was in Lake Zurich at the Alpine Races half marathon and I PRd by 15 minutes which I will never forget in my life. And my journey with BWRC started..I can proudly say I was with BWRC from the start. Praveen: That’s an interesting question. The same has been asked by many people in last two and half years. Some ask out of curiosity, some think I am crazy, and some are jealous that I run. My answer is very simple. I run because it’s fun. I run because I get to spend time with my running family. I run because it makes me healthy. I run because I like the pain (LOL). I run because I love to eat and drink. I like to take selfies after runs (LOL). Praveen: I am running the Chicago Rock ‘n Roll Half Marathon on July 22nd and might run another half before October which I have yet to decide. My next big race after that will be the Chicago Marathon in October for which I am currently training. I will not say that I don’t have a goal and I just run for fun. Nope, I do have a goal in my mind to finish my full marathon under 4 hours 40 minutes and half marathon under 2:10 minutes. Praveen: BWRC = “Family”. BWRC has become an integral part of my life and I am so happy with that. This group motivates you when you run, cheers you up when you are down, misses you when you’re are not around, helps you when you get injured, guides you at each and every step, and always wishes you the the best. What else does one need in a group? BWRC runners rock! Life is beautiful and I am one happy runner. All the credit goes to BWRC. Happy Monday, BWRC! We would like to announce that Tim McDonald will be our new Director of Sponsorship as Joe Carey has stepped down from the position to focus on his family and newborn son; Joe will continue to be a valuable member of the BWRC family. Tim has been leading our Couch to 5K Program and is a great addition to the BWRC board. We asked Tim to be our Member Spotlight Monday for this week so you can get to know our newest board member! Tim: I ran when I was in Junior High and High School then took a 22 year break. Tim: I started running again in 2010 I was 38 years old smoking 2 packs a day eating takeout 7 nights a week and 30 lbs overweight. At my height 30 extra pounds is NOT a good look. I received a call that my High School coach had passed away so I went to his wake, When I arrived I saw so many of my old teammates and they were all in such great shape. I could feel them looking me up and down. Seeing the pack of cigarettes in my shirt pocket. I decided that day that in 3 months on my birthday I would quit smoking. My birthday came and I kept my promise to myself. I put them down and have never picked one up since. Three months later I decided that I needed to get myself into shape so that I could live another 40 years. I started with the very plan I am coaching today, the C25K. It was the most difficult thing I had done athletically in over 2 decades. I worked my tail off and ran my 1st 5K in April 2010. Then I ran a few more 5K’s…then I ran a 10K in Oct…then a Half in November. Then in 2011 I decided to run my 1st Chicago Marathon to honor my sister battling cancer. If she could go through chemo I could run 26.2..
People say that one decision can change your life… mine was when I started back running. I was training for my 1st marathon in 2011 and ran into my future wife at Xsport. If I hadn’t found running again, I wouldn’t have found my wife because there would be NO WAY I would have been in a gym. We were H.S friends (full disclosure I chased her around as a freshman) and hadn’t seen each other in 24 years. I looked her up on Facebook and asked her out for a drink which turned into dinner at Jameson’s. The rest is history as we have now been together for over 7 years. It’s amazing how life works. Makes me wonder whose life will change for good in the current C25K group. I already see new friendships growing. Q: How did you find BWRC? Tim: I decided last year for my 7th marathon that I wanted to join CARA. I walked up for the 1st group run and felt like it was the 1st day of school again. I didn’t know ANYONE. I was so nervous. Believe it or not the 1st run I actually didn’t even say much more than a few words. By the 2nd time I was there I had started running with John Wall, Richard, Amanda as my group leaders. The 9 min pace group was awesome. They made me feel welcome and they realized about mile two of week two that their ears would be hurting for 16 more weeks. After training BWRC broke off and I joined them on their weekly runs. Q: Why did you join BWRC? Tim: I joined to be part of a group that truly cares as well as caters to runners of all ages, shapes, sizes, abilities and paces. I cannot wait to see my C25K team graduate and see them grow. Tim: I run to live and I live to run. It makes me happy. I always tell my wife that on my run “ I solve all the world’s problems” there is nothing better than zoning out and just enjoying the sights and sounds. Clears my mind. Tim: It’s truly a family and I am proud to be a part of it. Happy Monday, BWRC! This week’s Member Spotlight Monday is Judi Miko. Get to know Judi and her journey as a runner by reading her answers to our questions below! Judi: I started running in 1999 so I have been running for almost 20 years. I have to admit that the first year or so of “running” was more walk run and learning how to run. Back then most people still called it jogging. Judi: I have always been fairly active and enjoyed swimming, bike riding. I rode my bike, cross country skied, down hill ski, roller blading. Shortly after moving to the Chicago area I saw an ad for a triathlon. I swam, I biked so how hard is it really to run a 10k? Well I found out the hard way – I don’t know how but I managed to somehow push my way through all six miles and I wasn’t dead last ( close though). After that experience I was challenged and I really liked the swimming and biking portions so I figured I needed to learn how to run. It took a really long time to get to being able to for 40 minutes without stopping and I was not liking it much at all. A friend had started running and told me to come run with her and this group of runners. But they ran on Saturdays at 7 AM! What crazy person gets up that early? 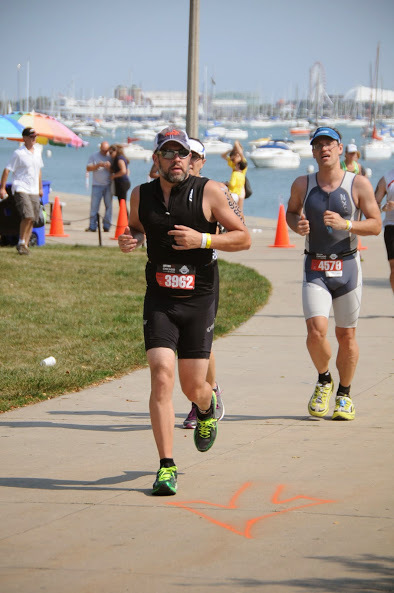 I did the same triathlon the 2nd time and while my run was not stellar I did fairly well. So well that my husband and my friend convinced me that I should do a half marathon 8 weeks later! I enjoyed that first half marathon and that fall I started joining my friend and her running group. They were all talking about running marathons, the Chicago Marathon and some of them were even running 50K and 50 mile races. I thought they were all a bit crazy. If you spend enough time around these crazy people you get crazy too. I was running to keep my friend company as she trained for the Chicago Marathon. I thought that was a pretty incredible goal to train to run that far. By August, she decided I was ready and signed me up to run my first marathon in 2000, now I was committed; back then you could wait until August to sign up! I was now officially a runner and hooked on running. I contemplated trying to run a marathon in every state. I knew of some people that were starting to do that. I even quit smoking sometime after my 3rd or 4th marathon. I made it to 6 states and 16 or so marathons before injuries, age and work obligations made me step back and stick to the shorter distances. Judi: After starting to run, I joined a local running club and through the years have belonged to several and was quite active in two of the clubs. Times change and people grow older, even runners, and I found myself shopping around for new groups to run with. I enjoy short solo runs but I was missing the company of running buddies on the longer runs. Many of the runners I used to run with have either moved away or could no longer run anymore. With the onset of modern high tech devices new running groups were popping up everywhere. I checked a few of them out. Many of them were really fast and I found I was running by myself, or there were people who ran my pace but were only going to run 3 miles. During this journey, I had met Mary Radloff Klabacha, Christine Moss, Tina Riess – we heard about this new group that was running in Busse Woods. Hey! I was running in Busse Woods. We decided we would check them out! I was hooked! I found a home. I found a great group of people who were just as crazy as I was about running. There was always someone to run with during rain, snow and below zero wind chills. Judi: I run mostly to keep in shape for triathloning – well, mostly. I run because it makes me feel good and I can justify that brownie or extra beer or two or three. Judi: I always say that I do not “race” but somehow I seem to have a lot of events through the summer. I tried to back off on the number of events but somehow the calendar seems to have filled up again. I will be doing the Frontier Days Stampede 10K and in August I will doing the Great River Ragnar as part of a 6 person Ultra team, and I will be doing the day of the Dead Elimination run in October, 17 mi . I also am signed up for 2 5K swims, 2 triathlons, and, oh I have a 2-day MS bike ride of 175 miles. Judi: I am so happy to have found BWRC! It means that I will always have someone to run with. This is a great group. Everyone is so supportive of each other. It does not matter if you are a speed demon, or a back of the pack runner, everyone is there to support you and help you to celebrate your personal achievements. I feel like I have a large family. It is nice to have runners of all skill levels gathering together. I like that the club is striving to help people get started in running and to keep them running. It is awesome being part of group that has so many experienced runners that are willing to take their time to help less experienced runners grow and improve their running skills. Thanks to this group I am running more again. I look forward to all of activities planned for this summer. I look forward to hearing about the journey some will make towards their first marathon. I look forward to being challenged and encouraged to improve myself as well. Richard: I started running sometime in the summer or fall of 2010 as a continuation of my weight loss agenda. I had started out just walking, doing 10k steps a day. Richard: Although I have always been physically active and thought I was in decent shape for my age, during a routine annual physical when I was 63, I discovered I had high blood pressure, high cholesterol, and at 160 pounds on a 5 foot frame, I was considered obese. I had picked up some bad eating habits after quitting a 2 pack a day cigarette habit, and apparently those sweets and junk food had caught up to me. Obese!!? I’m already short, old, hard of hearing, missing half my teeth and have questionable social skills, I don’t need to add obesity to the mess. The change in eating habits was actually not that hard. I simply stopped eating crap and with bossdears help, and her being a skilled and creative cook, we both started healthy eating. And with a few minutes on Google, I found that one of the best physical activities for weight loss was simply walking. So, I walked. And walked, and walked and walked, and bought a pedometer and walked some more, 10,000 steps a day. Every single day. If I needed some steps to meet my daily goal, I would take a walk around the block at 10pm. Or do laps around the living room. Or march in place in front of the tv. I was driving bossdear nuts. But. It worked. At my next physical, my blood pressure was normal and my cholesterol numbers were all good. And I had walked from 160 to 128 pounds. But, having met my original goals, I was quite frankly getting really bored with walking. I wanted to maintain my 10k steps per day goal, but, I figured if I started running, I could get it done faster. So, bottom line, I started running because I was bored. Richard: Someone from another running group mentioned BWRC on Facebook. I think there was also a photo with someone wearing a green BWRC shirt. Richard: I have been running in Busse Woods almost from the start. And I was always on the lookout for local running clubs or groups. I heard about AMP’D via Runners High and Tri and quickly joined up with them. Then I saw the mention in Facebook about BWRC and it sounded like a good fit, so joined up. I also run with HIP and the Deer Grove Trail Runners on occasion. You can’t have too many running groups but believe it or not, I really enjoy running mostly by myself. Richard: I run for fitness, for stress relief, for solitude, to challenge myself. Also for wine and donuts. Richard: I’ll be running the Got2Run 8K in Arlington Heights on the 19th of May. I’ll be running with co-workers in the JP Morgan Corporate Challenge on May 24. I’m running the half marathon/5k challenge in Sioux Falls South Dakota in September. I’m still trying to decide about running the Des Moines Marathon. One of my goals is to break 5 hours in the marathon. Richard: I’m not a very social person, so BWRC helps get me out of my comfort zone. Because, let’s face it, BWRC is VERY social. I’ve never seen such an active group. There is always something going on. Sometimes I get exhausted just reading over the upcoming events list. Roma: Let me qualify the question, as a runner who signs up for races since 2010. I signed for a 10K in 2010 with no experience in training for a race. I was supposed to run it with a colleague from work, who chickened out a couple of months before the race. I didn’t want to back off hence trained on my own, believe it or not, I used to run around a 400 mt track and count the laps to ensure I ran 10K every couple of days a week. That’s how inexperienced I was! And I can’t even begin to tell you how I felt when I lost count! Didn’t have a Garmin watch either, those were good times! Roma: My in-laws were visiting one year when I lived in Dubai, my ex father-in-law (who is an avid runner) told me about a group of runners he ran into on one of his morning runs. This group ran the perimeter of a Park close to where we resided. The group of runners met twice a week and each runner jotted down a time they would complete a full loop around the park in, think it was about 2 miles or so. And the person who came closest to their stipulated time would win a bottle of wine. I was sitting up by the time he finished his sentence. That was a bit of useless trivia…but the long and short of it is I started running to drink wine and of course it was my best stress buster! Roma: My very dear friends (who I met through a run group) Christine and Tina told me about Jim and Amanda and how amazing their group was, asked me to show up for one of their group runs. Rest is history! Roma: Why wouldn’t one join BWRC! This is an amazing group of people who motivate you every time you show up. They are all passionate about running and I love the philosophy, no one gets left behind! 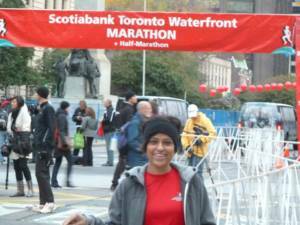 Roma: Running helps me to stay healthy, clear my mind and refocus my attention on important things in life. Roma: I am signed up to do Soldier Field 10 miler. Roma: You mean my running family? That’s what BWRC means to me. I have met wonderful people like Laurie, Rick, Amanda T, Jim, Amanda, Lauren, Emily, Peggy, Mary, Judith, Katherine, John and his wonderful daughter Jess…the list is endless. All I want to do is run and BWRC helps me accomplish that. Happy Monday, BWRC! This week’s Member Spotlight Monday is Erika Hansen. 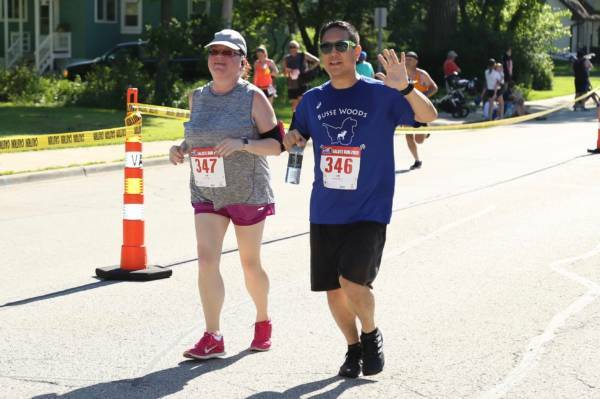 Erika is one of BWRC’s coaches for the Couch to 5K Program; read the post below to learn more about Erika and why she enjoys running and BWRC! Erika: I started running about 9 years ago and started taking it more seriously within the last few years. Erika: I originally just started for fitness, but soon became a runner for stress relief and then fun! 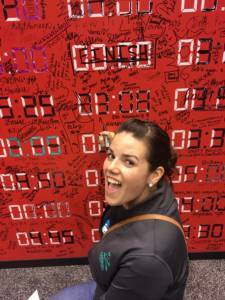 Erika: I found BWRC last summer, when I began training for my first Chicago Marathon. Erika: Training for the marathon was a great introduction to the club and its’ members. It’s so great to have a group of people organizing runs and workouts for you to keep you motivated. I also really love meeting new people and making new friends, and BWRC is a perfect opportunity for that. Erika: My primary reason for running is health–both physical and mental. I also run to challenge myself and accomplish new goals; it’s pretty fun to watch yourself progress and do things you didn’t think that you could. Erika: I’ll be running the North Shore Half Marathon in June, and I do intend to run a sub 30 5K one of these days! Oh, and I’m getting married in May…that’s a pretty big goal, too! Erika: To me, BWRC means an amazing opportunity to run with people of all abilities who love it, just like you do, and that’s really inspirational. All of the members are so welcoming! Happy Monday, BWRC! This week’s Member Spotlight Monday is Joey Jao. 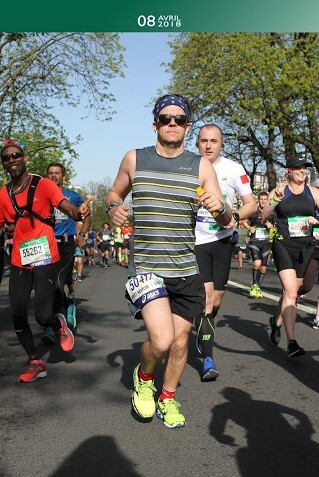 Joey talks about the role running played for him in choosing to live a healthier life and how BWRC helped him in training for his first marathon last fall. Continue reading below for his answers to our questions! Joey: I have been running for 9 years. Joey: All of my friends and family around my age were having children. I absolutely loved having them around, but I was at my heaviest in 2008, and it was sometimes difficult for me to keep up with them. My dad passed away when I was in high school so I always just assumed that I would have the same fate as him. As I saw these kids growing up, it dawned on me that I could make changes and live a longer, healthier life. I started exercising and eating better, and lost 50lbs in a year. After that year I felt like I needed to find the next thing. That next thing was running. Joey: Last year, I signed up for the 2017 Chicago Marathon, and I needed somewhere to train. I saw that there was a running group in Schaumburg which is close to where I live so I started showing up and fell in love with the group. Joey: I originally joined BWRC because I needed someone to keep me accountable with my training. I keep coming back because the group is so welcoming to everyone, regardless of experience or pace, and I want to be a part of that. Joey: Running gives me a break from the world and time to be completely in the moment and sometimes lost in my thoughts. Between work, school, marriage, and caring for a child with special needs, it is easy to just skip taking care of yourself. There will always be things that need to be taken care of, but running gives me a quick escape to take care of myself, not only physically but mentally as well. Joey: I don’t have any races lined up this year. My goals are to have sub-30min 5K and a sub 5hr marathon. Joey: Even though I have only been running with BWRC for less than a year, it represents good friendship. You know how you have those friends who you might not see for years, and then you finally see them, and nothing has changed between you? You reminisce about the time you were chased by skunks or that time you broke out in a full out dance party in the middle of the forest preserve (both of those happened to me last year with BWRC). You pick up exactly where you left off. No eye rolls or judgement, just pure happiness and excitement to see each other. That’s how I feel whenever I meet up for a run with BWRC. Happy Monday, BWRC! This week’s Member Spotlight Monday is Simone Reuther. Simone and her husband Tobi moved to the Chicago area this past summer where she literally “ran” into BWRC members in Busse Woods and the rest is history! Read on below to learn more about Simone’s journey with running and why she loves BWRC! Simone: I’ve been running for more than 15 years. Simone: I started running during my high school exams to clear my head after some long days of studying. My roommate during college was a runner and we started training together with another friend. The two guys were always faster than me and this pushed me lot. All of us were in Physical Therapy school at the time and we started to try out the different training principles we learned on ourselves. Experimenting with different types of training was a lot of fun. One day, my two running partners convinced me to run a half-marathon with them. Ever since I was hooked. Simone: I literally ran into the group during a run in Busse Woods. We had just moved to the area and I was looking for a new running group. Our landlord Moira had told me about the group of wonderful people she was running with. And coincidently, I met exactly this one group out in the woods. I am convinced it was meant to be this way. Simone: From the first moment on, I felt drawn to this friendly, welcoming and fun group of people. Everyone is very supportive and an inspiration to become a better runner and person. Simone: I run because running makes me feel good, puts me in a good mood, clears my head, reliefs stress and helps me deal with emotions. Sometimes when I am angry my husband Tobi tells me: You really should go for a run… And indeed, it helps. When I come back, I always feel better. Simone: I will run the Half Marathon in Carmel. Other than that, I don’t have any races planned for this year, yet. I am not very competitive and enjoy the training process at least as much as I enjoy running races. Simone: I am so grateful I found BWRC. I was looking to meet new people and have found way more than that – I’ve made great new friends. I look forward to every run with the group and the wonderful, funny and sometimes deep conversations we have during our runs. Happy Monday, Runners! This week’s Member Spotlight Monday is Richard Ridlington! 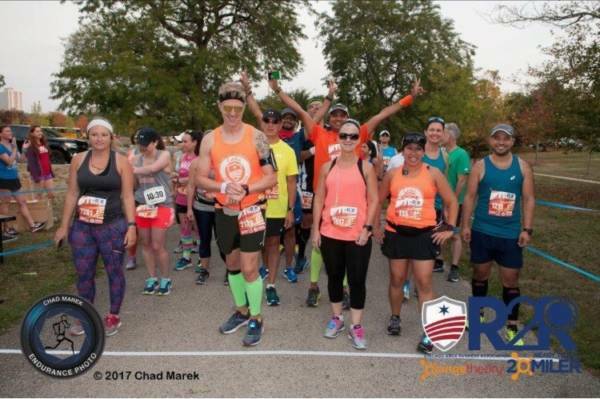 Read below to learn more about Richard’s journey with running and BWRC (with his signature comedic twist, of course!). Richard: I started running early in my life, I had an older brother who, as soon as he finished eating all his candy, came after mine…I’d PR almost every week. Richard: I was in my early 40’s and having a mid life crisis, it was my third of the week and it was only Tuesday morning, something had to be done. I couldn’t afford a fancy sports car, I toyed with the idea of climbing mount Everest naked and then I thought I could combine the two… Running ! It combines the thrill, excitement and glamour of fancy sports cars and you get to freeze your %^$#& off wearing an atom thick layer of Spandex in the middle of winter. Sign me up! Richard: I found the initials BWRC scratched on the wall of the men’s room of a rather seedy establishment I frequent….sounded sordid, adventurous and just a little naughty. Sign me up! Richard: I didn’t know I’d joined, I wasn’t wearing my glasses when Amanda made me sign a piece of paper ….do I get time off for good behavior? Richard: Why? If I had a penny for every time I’ve asked myself that question I still wouldn’t be rich enough to pay someone to run for me. I don’t like running, it’s hard work and I tend to smell a bit funky afterwards. I find the best bits of the run are the first step and the the last one, everything in between is a constant battle with the small relentless voice in my head…”It’s OK to stop”…but that’s why this group is SO important. BWRC get’s me out there every week. I think some form of sport or exercise is essential for both body and mind, all I have to do is take a couple of days off and I start to get cranky and lethargic. I may not always enjoy running but I do enjoy that feeling of being able to run. At some point you have to make a choice about actively taking care of yourself and not just going with the flow. I just count myself lucky that I found this great group of people who make it easier for me to follow through with my choice. Richard: Goals hmmmmm. I used to have goals and then I’d get mad at myself for not meeting them. Doh! These days I admire those runners who just get out there every week and enjoy themselves. I’m sure they’d be happy if they PR’d but they won’t let a less than stellar time ruin their day. Having said that I will be running Chicago again this year and hoping for cooler weather (pretty please I want my sub 4). I’d like to run a couple of 1/2s before then just to keep the excitement going, and of course there’s always the Schaumburg Turkey trot, burger and beer, at the end of the season. Richard: The people in BWRC are unique, an eclectic bunch of misfits made stronger by their differences. It’s a bunch of people from all over the map who all seem to share the same mutual respect and who are willing to give each other the room and encouragement to be the person they are, quirks and all (you all know who I’m talking about). I like them and I always look forward to spending time with them (once we stop running :-)). If you want to see a group of smiling people, come run with BWRC. Lauren: Hmm. Tough question! My first “race” was a Santa 5K in 2012. I guess I’ve been running 6 years! I haven’t felt official until recently, thanks to the BWRC! Lauren: I actually started running to lose weight! I lost 40 pounds thanks to this lovely addiction. I continue to run because I now enjoy it and can’t imagine my life without it! It’s my therapy. Lauren: I found BWRC thanks to Joey Jao! I can never thank him enough!! I tell him all the time he changed my life by sharing this group with me. 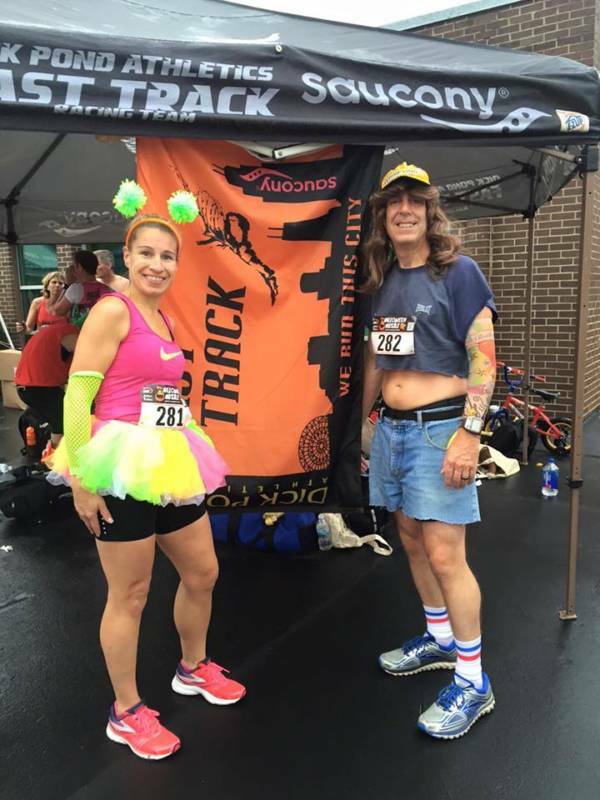 Lauren: I joined BWRC to reach new running goals and meet people who are my kind of crazy! Nobody understands me more than my fellow running buddies! Lauren: I run because it makes me a happy and healthier person! Running helps me decompress after a tough day teaching, yet also helps me celebrate the great days. It makes me smile when life can seem overwhelming! Nothing can compare to the positive vibes I feel after a run with my friends! I couldn’t wipe the smile off my face if I tried! Lauren: I am running the Carmel Half Marathon on March 31st. All thanks to Richard, I PRed at the Schaumburg Turkey Trot with a 1:58, when my previous goal was a sub 2. Although 3 minutes seems silly, my new goal is 1:55. I’m also running the Chicago Marathon this year. I haven’t set a goal for that yet! Lauren: BWRC means the world to me. It’s been life-changing! I look forward to every single run. Even when I am tired after a long day, I know I’ll be happy and smiling the second I see everyone at a group run! My favorite day of the week is Saturday because of our long runs in Busse! Our post-run coffee is always a blast and I couldn’t imagine ANY weekend without my running family! Thanks for making me my best self. I seriously love you all more than words! Happy Monday, Runners! This week’s Member Spotlight Monday is Brian Jung! 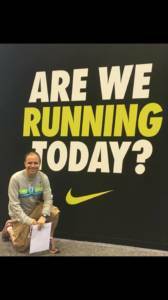 Read below to learn more about Brian’s journey with running and BWRC! Brian: My defining moment as a runner came in 2014 as I struggled through a solo training run after signing up for my first half marathon. Along the trail, a group of cyclists called out “runner ahead” as they approached. I looked around to see who they were talking about. It was me…I was the “runner”! 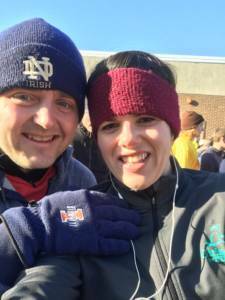 Brian: High school cross country and track had long passed and an annual Turkey Trot 5K had become the extent of my yearly exercise…I needed to get into shape! 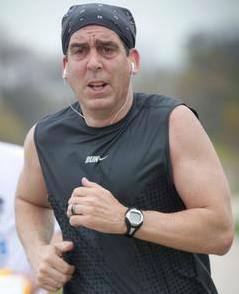 Brian: Soon after catching the running bug, my wife and I registered for our 1st Chicago Marathon in 2015 and signed up to train with CARA (Chicago Area Runners Association) at Busse Woods. Even though I was slow and out of shape, I was welcomed! At the time I didn’t know it, but my ‘one-and-done’ marathon would turn out to be only just the beginning! 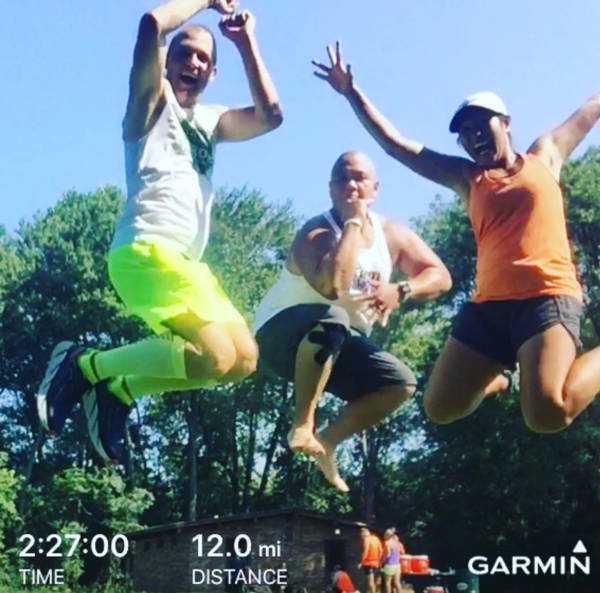 Brian: After taking the winters off between my summer marathons, there was much room for improvement; I was looking to start running year-round with a group of like-minded individuals. While many in the group had different goals and levels of experience, the common thread that bound us was our passion for running and the joy that we got out of helping each other succeed. Brian: What began as an exercise ‘chore’ has evolved into a healthy and rewarding lifestyle. Running has helped me to lose weight, improve my overall health and focus, provides structure in my day, goals in my life, and through it I have formed long lasting friendships with incredible individuals who I may have otherwise never met! Brian: I am registered for the Carmel Marathon in March, Ragnar (a 200 mile, 12 person relay from Chicago to Madison) in May, the Chicago Marathon for the American Brain Tumor Association’s charity team in memory of my dad in October, and the Tunnel Hill 50 mile ultra marathon, which will be my first, in November! Brian: BWRC has become like a family to me. There is a feeling of pride in seeing each other work hard and succeed. I am grateful for the knowledge and experience that I have gained from so many talented members of this club and hope to one day be able to pay it forward and inspire others whether it be as a pacer or simply as proof that you don’t need to be fast and fit to begin your running journey! Happy Monday, BWRC! Beginning this week we will be featuring a member of our club every Monday for Member Spotlight Monday! Our first spotlight is on Tina Riess. Read below to learn more about Tina’s journey with running and BWRC! 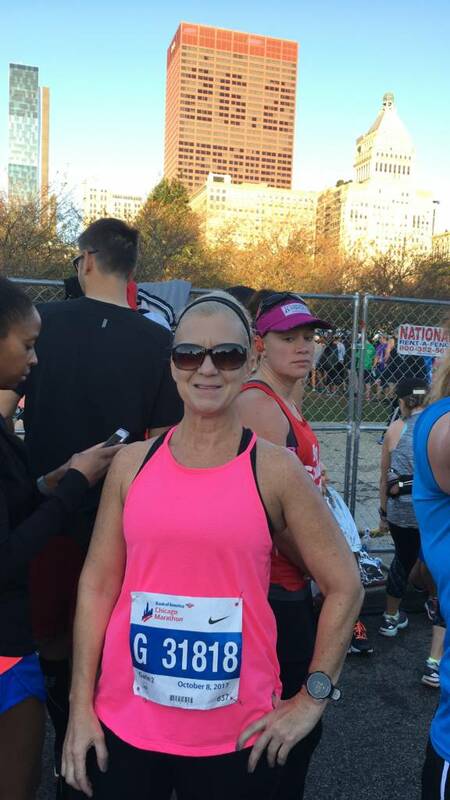 Tina: Once I ran my first 5k (Schaumburg Turkey Trot) as a random fun event, I became hooked after that. Tina: I was directed to BWRC by Christine Moss, she told me about the groups Facebook page and told me I needed to check them out ASAP! Q: Why did you join? Tina: The group had everything I was looking for. Support right from the start was the main thing, I was accepted and supported from the get go, even though I am a much slower runner, I was welcomed and not left behind even though I was new and did not know many people. We are all treated the same whether we are slow or fast. There is no competition, bragging or egos. Its friends running together. These were important things I was unable to find elsewhere. Tina: I run because it honestly makes me feel good, I get to spend time with my running friends, and helps keep me focused. 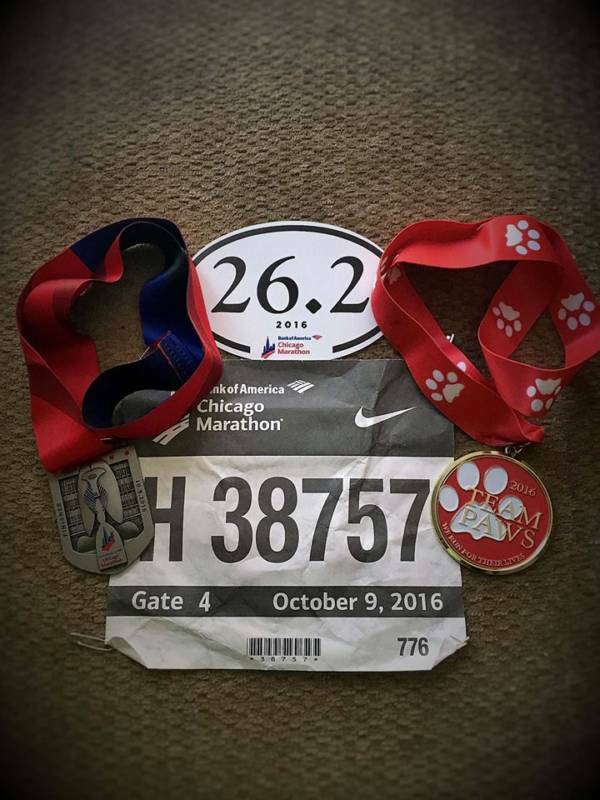 Tina: I have a few upcoming races, one is the Naperville Women’s ½ marathon in April, followed by the Solider Field 10miler in May, my biggest of the year is my first marathon, the Chicago Marathon that is in October, I am running for PAWS charity! Tina: BWRC has become more then just a run club to me, it has become a major part of my life, has led to some awesome friendships, and some REALLY fun times. BWRC accepted me from day 1 and never made me feel like I did not belong. I honestly look forward to every single BWRC run, every event, and cannot wait to see what the future of BWRC holds!